IBASSIN: 2018 FLW Tour Harris Chain Day 3: Chris Johnston Claims Slim Lead with lbs! 2018 FLW Tour Harris Chain Day 3: Chris Johnston Claims Slim Lead with lbs! Gustafson in 5th, 7 pound out of lead. If it’s going to happen for Chris Johnston, it has to happen early. At least, that’s what his results on days two and three of the FLW Tour event presented by Lowrance at the Harris Chain suggest. Chris Johnston' needs his "honey hole" to produce one more day. On day two, the Ontario pro experienced a quick flurry of action right after takeoff that lasted until about 9:30 a.m. and produced most of his tournament-best 25-pound, 7-ounce stringer. Today, the action was similar. 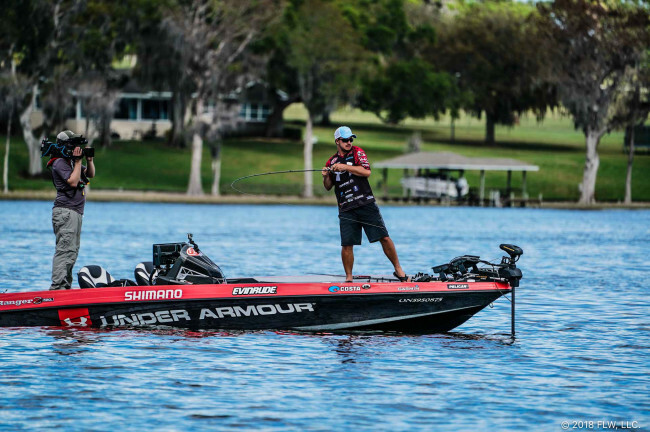 Johnston made his first cast just two minutes after takeoff and hammered away at fish after fish. Yet, the bite shut off earlier – at about 8:15. Both days he parked on a key indentation along an edge in some offshore hydrilla, and he’s hoping there are enough fish left there to produce one more morning flurry to carry him through to the win. With 16-12 today, Johnston’s 62-pound three-day total leads second-place pro Tony Dumitras by only 14 ounces. Johnston says that after he left his starting spot he went nearly six hours before catching the next keeper that could help his limit. Along the way, he landed a few on a ChatterBait and broke off a good one on a bed. Eventually he had to audible to a secondary pattern he’s had his eye on all week, stemming back to when he lost a good fish in a fray of surface schooling activity on day one. Ever since, he’s been on the lookout for more breaking fish. Today he found it and was able to capitalize at 3 p.m. with just minutes left until check-in. “There were quite a few fish in the area. I wish I’d had another 20 minutes,” he says.